Venezuela-Europa: How ill is Chávez really? Somehow I'm glad he didn't die and when the high oil prices bubble bursts many people will see him for the hack he really is and wont become the next Peron. We can only guess, but I don't think prices will drop dramatically anymore. They can stagnate at most. Chávez will try to ask for loans time after time and that could give him a few years more. The opposition must urgently take a twofold strategy. It is not only about winning the elections next October. It is about creating efficient networks nationwide to discuss on a permanent basis about the economy and plans for development, it is about educating people and telling them that if the economy is not completely tanking, if some of them are still getting some Mercal food etc and the hope to "win the lottery" with a house (nothing but a lottery these days), it is at the cost of their children's future. And then we need to explain as best as possible about how the current government is giving our resources away, how much people could do with what is now being spent in weapons, and last but not least we need to explain about the corruption cases like the one Coronel has documented so well. People are not stupid. They just got a crappy education, they have no framework of reference. Just educate them! This is a middle-term process at best. If you don't start it right now, we risk a civil war or just further underdevelopment for many decades to come. 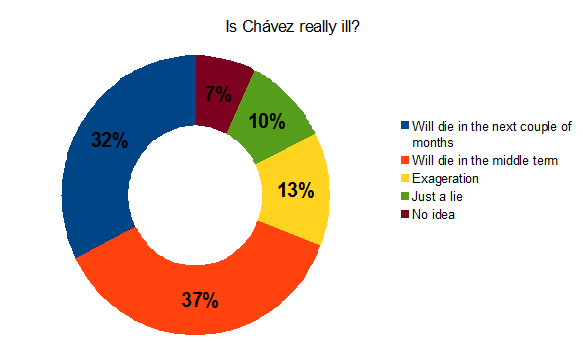 But regarding Chavez's illness I'm glad it wasnt as bad as they said so he can face eventually the consequences of his actions, if not the political ones, the criminal ones and doesn't become a Peron figure in Venezuela.